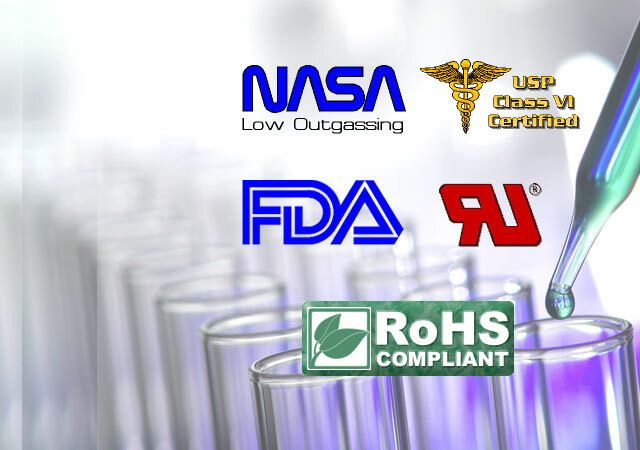 E-linking grades meet NASA, UL, USP, FDA and other certifications for low outgassing, flame retardancy, biocompatibility, food compatibility and more. Additionally, E-linking offers one component silicones that meet MIL-A-46146 and MIL-A-46146A Type 1 specifications. These compounds feature superior quality and performance. They are used in many critical applications in a wide range of industries including aerospace, medical, optical, electronic and telecommunications.